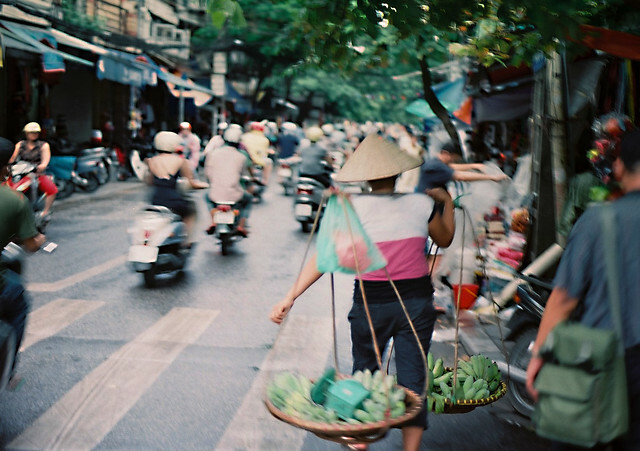 Hanoi is a city with incredible architecture, history and food. The dynamic mix of flavours that make Vietnamese food so distinctive are best experienced in the back alleys and small cafes of this beautiful, tangled city. Holiday comparison sites can help you source inexpensive travel arrangements and accommodation, leaving visitors with ample funds to explore and taste all that the city has to offer. From the French inspired cafe culture to the seasoned pork and vermicelli dishes that will make your mouth water to the ubiquitous Vietnamese Pho (beef noodle soup), here are some of the very best spots to refuel and revel in Vietnam’s burgeoning culinary scene. This ramshackle destination sits right in the heart of Hanoi’s old quarter and has been in business since 1936. Hanoi is famous for its cafe culture and this is the perfect place to experience it in all its glory. Sip on the house specialty of iced coffee with yoghurt while you perch on a wicker stool and take in the battered antique aesthetic that makes this place so popular with the locals. Lunch time in Hanoi happens around 11am and is marked by the strong aromatic smoke that fills the streets. Bun cha (barbecued pork) is a delicacy from the north and an extremely popular lunchtime dish. Sidle up to some locals at this alfresco kitchen and watch the proprietors prepare the pork over a tiny coal fire. The pork takes on the sizzling smokiness of the embers and is served atop cold vermicelli noodles in a vinegary fish sauce broth, carrot and cabbage pickle and a plate of fresh pork spring rolls. This lunchtime feast is authentic, delicious and cheap. No visit to Hanoi would be complete without tasting the city’s most popular export: pho. This beef noodle soup is a staple among locals who traditionally consume it first thing in the morning or late at night, but undoubtedly every single day. Pho 10 is in Hanoi’s old quarter and is one of best places in the city for this particular delicacy. The kitchen window is perpetually fogged up by the steam from huge vats of bubbling beef stock and the aroma will draw you in and keep you coming back for more. A bowl goes for about 20,000 dong and can be garnishes with handfuls of chilies, bean sprouts and a generous squeeze of lime.